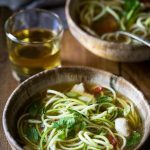 My Paleo Chicken Noodle Soup with zucchini noodles (or zoodles) can be made in 20 MINUTES! It’s packed with flavor, is whole30 and gluten free too! Zucchinis are at top of the ‘dislike’ veggie list for my kids. I thought that spiralizing them and trying to pass them of as noodles would fool them, but it didn’t, not even for a minute. My teenaged son now outflanks me by knowing how my own phone works in more detail than I do, so he was never going to buy into pasta noodles made from vegetables, but at least I tried! 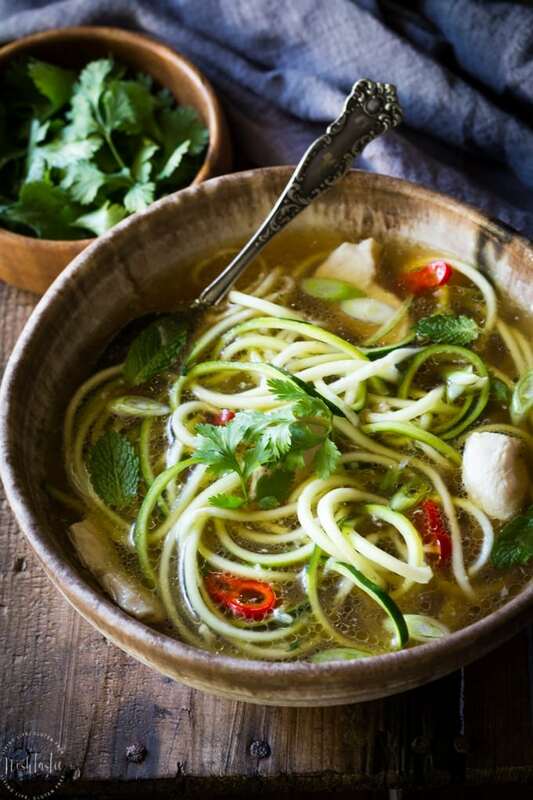 While my kids took one look at this soup and opted for peanut butter on toast instead, my other half was waxing lyrical about how the spiralized zucchini noodles have a much better and firmer texture than zucchinis cooked in slices, which often end up soggy and unpalatable. And it’s true, I think the texture is much, much nicer with ‘zoodles’ than it is if you cut them into pieces and cook them. And maybe you don’t need me to point out that you don’t need to boil the zucchini noodles to death, that will do them no favors at all and just make a big old mess. I forgot to mention using homemade chicken broth. While, yes, you can absolutely make this with ready made gluten free/paleo chicken broth, it goes without saying that the taste of your soup will improve a hundredfold if you make your own. And an added bonus of using homemade chicken broth is that it increases the odds of your recalcitrant soup hating relatives (some of them, at least…) trying it, and loving it. 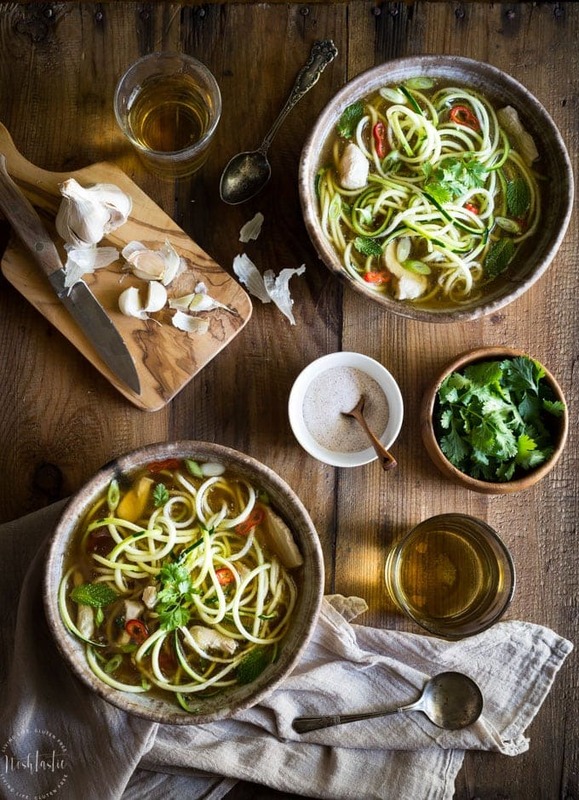 If you’re going to make zucchini noodles then you’ll need a spiralizer to do it with. You could use a julienne peeler I guess, but it’s so much more work and you won’t get spirals, just short noodles. Plus it’s much more time consuming, I’ve tried it and it’s a bit of a hassle to be honest. I’ve had the Paderno Spiralizer for a while and I really like it. I bought it because it was really well rated on Amazon, plus I asked in my foodie Facebook groups and that was the brand that everyone favored. So far I’ve had no broken pieces and it works exactly the way it says it will. We’ve used it for a variety of vegetables including butternut squash and sweet potatoes. I recently made sweet potato noodles with it and roasted them in a hot oven with a little oil, salt, pepper and garlic, they were SO tasty! They do shrink a low, so if you try them you might want to spiralize more than you think you’ll need. For zucchini noodles, or zoodles, I find that I get best results if I pick a zuchini that is fresh, somewhat fat, and straight, if possible. I start by slicing the curved ends off and then cutting it in half so I have two similar sized pieces. In order to get maximum spirals (and not little half circle pieces) you want to center and push your zucchini pieces onto the circular attachment with the spikes, then you should get the long spiral noodles once you start turning it. I’ve found that if it’s off center too much then I don’t get as many spirals and the pieces are shorter. They’ll still be edible of course, so don’t worry if that happens the first time you try it. I guess that’s up to you, but I never peel my zucchinis for recipes like this as I don’t find it necessary. I think the skin helps keep the noodles firm, at least that’s what I tell myself. The real reason I don’t peel them is that I don’t want to make more work for myself, and it doesn’t make any difference to the flavor of the soup either way. Before you go I wanted to share a few more soup recipes I think you’ll enjoy. I recently posted this Roasted Paleo Butternut Squash Soup with Apple, it’s so easy to make and super healthy too, It can be made vegan and Whole30. Another one that’s super popular with my Instagram fans is my Creamy Paleo Cauliflower Soup with Coconut Milk . It has just a hint of nutmeg and is Paleo, Dairy free, and Whole30. And lastly my Paleo Carrot Soup recipe with Coriander and Garlic. It’s a delicious spin on your average carrot soup, you’ll love it! 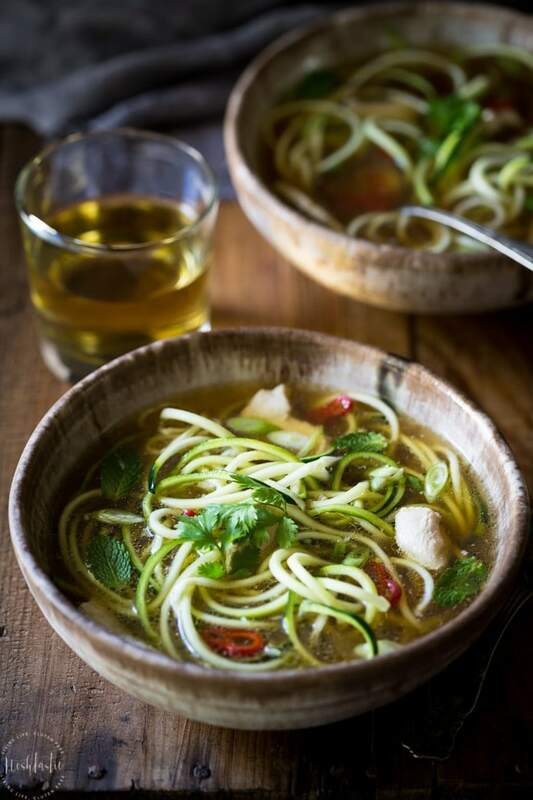 My Paleo Chicken Noodle Soup with zucchini noodles (or zoodles) can be made in 20 MINUTES! It's packed with flavor, is whole30 and gluten free too! Pour the homemade chicken broth into a large saucepan and bring it to a simmer. Add the garlic, ginger, and sesame oil and cook for 5 minutes on a low-medium heat. Add the cubed chicken breast and continue cooking for 10 minutes. After 10 minutes add sliced green onions, spiralized zucchini noodles, snow peas, and chilis if you are using them, cook for a further 3- 5 minutes. I’m eager to try this recipe but you don’t mention how much chicken broth to start with in your ingredients? Hi Christina, thank you for your patience! I recently moved my recipes from one recipe widget thing to another and some of the ingredients seem to have disappeared along the way! I’ve updated it now. THANK YOU!!! = ) Looking forward to trying this! Have a great day! This was delish! I used Begay broth and tofu!